Located within a dedicated family zone on Deck 2, the Family Harbor accommodations offer an array of staterooms and suites in a nautical flag motif that accommodate up to five family members. Parents and kids will have even more room to relax at the exclusive Family Harbor Lounge, a secluded space designed as the ultimate family hang out with large-screen televisions, games and complimentary breakfast and snacks. 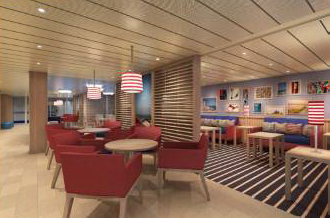 The exclusive Family Harbor Lounge decorated in a nautical flag motif (in red, white, blue and yellow), is a secluded space designed as the ultimate family hang out. Located within a dedicated family zone on Deck 2 aft, the Family Harbor accommodations (96 in total) offer an array of suites, aft-view extended balconies, cove balconies, deluxe ocean view and interior staterooms, all decorated in a nautical flag motif (in red, white, blue and yellow). 2476 and 2491: Staterooms are Fully Accessible. 2462, 2470, 2477, 2485: Staterooms are Fully Accessible-Single Side Approach. 2478, 2493: Window has obstructed view - outside the stateroom is a small open steel deck which guests do not have access to. 2458, 2475: Window has obstructed view - outside the window is a metal control unit. All staterooms feature two bathrooms: one full bathroom with a shower, toilet and sink and additional bathroom with a junior tub and sink. All Family Suites feature two bathrooms: one full bathroom with a shower, toilet and sink and additional bathroom with a junior tub and sink. A room divider with a privacy curtain separates the twin/king from the double sofa bed and upper. 2398 and 2425 do not have an upper berth.